Well I've started to write a number of games in my old Amstrad CPC days. But just a few of them were ever finished. Down below you'll find a list of all the games I've ever wanted or started to write. Enjoy! In Megablasters you and your friend can take control of Bob and Bart, two young boys who have to rescue their kidnapped twin brothers in order to save the world. After finishing my Ghostbusters hommage "Ghosthunters" I tried several different new ideas. "Last Mission" unfortunately was the only one that ever got finished. Most of my games and demos were kind of slow and I didn't really figure out why. So I thought I maybe should use interrupts to get the stuff faster - I obviously didn't get the idea of interrupts right (or you could put it the other way and say that I was way ahead of time, by thinking that interrupts actually were multitasking.) I had just read about interrupts in my CPC Assembler book and I was desperate to try this new knowledge out. When the CPC conversion of Space Harrier port came out in 1989 I played it a lot, even though I didn't like the fact, that Elite used vector graphics instead of textured sprites like in the original Arcade version. (Also I couldn't fix a hydraulic chair to my CPC, so that I didn't get the real Arcade feeling... but that's another story). I don't remember how I got the idea for this game. In this game you were supposed to be a cop and had to solve crimes and mysteries, drive around in a car or a motorcycle and shoot other people. After finishing my Dynablasters/ Bomberman clone Megablasters I wasn't sure what to do next. I was working on my parts for the Divine Megademo, but I also intended to write another game. I was a big fan of the game Tetris! This game didn't have great graphics, it didn't offer a complex gameplay, it didn't have lots of different stages and you couldn't even win it - but nevertheless this game was really addictive. Millions of other Tetris players can surely confirm this. In 1991 I was often playing the Broderbund Amiga Game "Wings of Fury". In this game you were playing the pilot of a Hellcat, a 1944 World War II airplane, in the Pacific and had to destroy Japanese military installations. It was a vertical scrolling shoot'em up game that obviously also was ported to the Amstrad CPC (as I've just found out while looking for more information on that game in the Internet). When I started to create this game I was obviously playing "Get Dexter" (Crafton et Xunk) a lot, since the main character of this game bears a huge similarity to the Xunk character of that particular game. 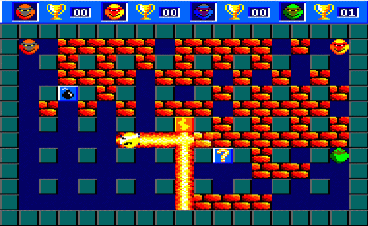 This game of mine was a clear cut copy of Ocean’s 1987 CPC smash hit “Gryzor”. I used to play Gryzor a lot. In the end I was even so good at the game that I was able to win it without loosing a single life! The story for this game is quite funny. When I was attending high school we’ve had a farmers’ son in our class. Everybody teased him for being a farmers’ son - Teens are cruel. But he also fought back very well. Sports games were (and still are) a very popular theme on the homecomputer. Most sports games in the eighties and early nineties forced the player to wobble the joystick like crazy to make the athlete on the screen move. 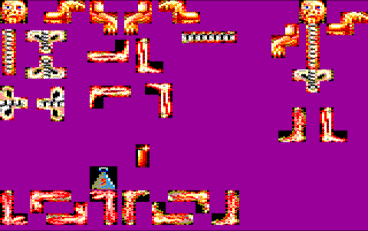 When I started writing up the text for this game I figured out that I don't remember the name of original Spectrum game which was the exemplar for my CPC conversion. I thought it's name was "I, Ball", but when I looked up the game with this name I found out that this was different from what I had in mind. In 1992 my sister was playing the various installments of the role playing game "The Bard's Tale" a lot. Since there wasn't a CPC conversion available at that time and none was annouced I thought I could take up the job of creating my own interpretation of this topic. While experimenting with interrupts I had the idea to create a Westbank type game that uses interrupts to control the doors that open every now and then to reveal a customer or a bank robber. After finishing Megablasters I was a little uncertain on what to do next. Rex of Beng! tried to convince me to create a Zombie fighting game with him called "Rigor Mortis". (We actually started to work on it, but also never finished it). But I also had some ideas for other projects. After we had finished Megablasters Rex wanted to start on a new game right away. I was a bit sceptical whether I wanted to enter such a huge commitment again. Deadris was essentially an idea of Rex. I once told him that I initially intended to include a hidden game in Megablasters, but didn't had the time to write it anymore since the release date forced me to finish the game early.